Cretan Flora through a Macro Lens: article and photos on Honeyguide's website here, featuring flowers photographed in April 2011. A Flowers of Crete Art and Photography Exhibition took place at the Orthodox Academy of Crete in June 2011. The title of the exhibition was Rare and Endangered Plants and was held during the ECOTHEE Conference on the Environment. The conference was attended by delegates from around the world, an opportunity for artists committed to the environment to share a stage with people from other disciplines. 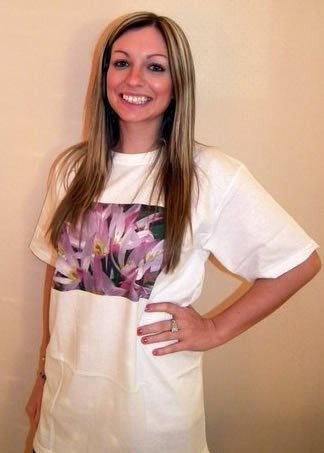 Good quality machine washable T-shirt printed with an original photograph of the endemic Tulipa cretica - the Cretan tulip. In white, sizes S, M, L, XL. Details of Flowers of Crete on back. 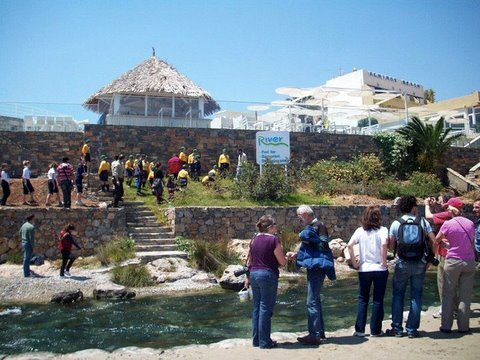 At the beginning of November 2011, Rosemary and Julia began a project to produce a species list for the wetlands at Almyros in order to help the Clean Up Mirambello Bay group promote the importance of this fragile environment. At the time there were only three plants in flower, but it is hoped to complete a full twelve month's survey recording and photographing species in flower and fruit. Anyone wishing to support this work and contribute towards the costs of this survey can contact Julia or Rosemary for more information. Julia and Rosemary are also hoping to complete a twelve months species list for the orchid meadows above Elounda. Wetlands, typically small ones on Crete, are under pressure, as everywhere around the Mediterranean. The wetlands of Almyros - a mixed freshwater and brackish wetland including a small lake created by a dam, a freshwater stream and sand dunes, situated next to a busy tourist development - provide a precious environment on Crete’s north coast to the east of the town of Aghios Nikolaos. The local community has come together to define its boundaries as a step towards its protection. Flowers of Crete contributed seeds and plants of sand dune species such as sea daffodil Pancratium maritimum and yellow horned poppy Glaucium flavum, to help with stabilisation of the wetland boundaries. Right: Flowers of Crete talking to a local journalist; scouts are planting shrubs on the bank above an illegally built wall. Read more here (a summary translated from Greek). On 9th April 2011, Environmental Archaeologist Jennifer Moody and landscape historian Oliver Rackham, joint authors of Authors of 'The Making of the Cretan Landscape', emailed those who signed the petition urging protection for Cavo Sidero with good news. With their permission we repeat their letter in full (and unedited - hence the American spellings). Thank you! You really did make a difference! On December 3, 2010 the Council of State, Greece's Supreme Administrative Court, found in our favor and canceled approval of the Cavo Sidero Golf Resort. Copies of the petition, including comments, were placed before the judges and formed an important part of the evidence. This has been a long, hard fought battle by thousands of people but especially a core of some 300 local citizens who took on big business and big government and against incredible odds won this court case. 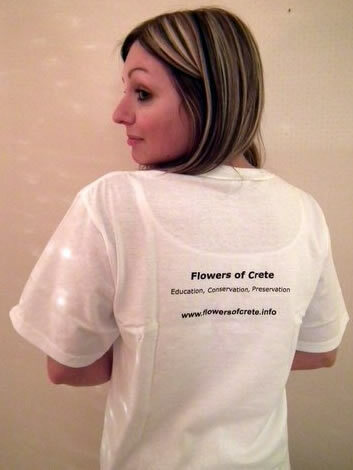 Your support bolstered morale and demonstrated that this was not merely a local affair; that the world does indeed care about the future of this remote corner of Crete. People from 88 countries all over the world signed the Cavo Sidero Petition: 40% from Greece; 16% from France; 13% from the UK; 8% from the USA; 5% from Belgium; 4% from Germany; 2% from Italy; and 1% from Switzerland, Canada, The Netherlands, Spain, Austria and Cyprus. We are delighted that so many people, according to their comments, have been all the way to the north-east tip of Crete and know and appreciate its beauty and its wildlife. Sadly, the landscape is not entirely secure. The land remains in the hands of Moní Toploú which continues to allow serious overgrazing and the bulldozing of antiquities. Cultivation of the Itanos basin is still leaking agro-chemicals into the Vaï palm-wood. Most alarmingly, we hear that the palms have now been attacked by the Red Palm Weevil, an insect that has decimated many kinds of palm trees from India to California and is now ravaging Crete! Also, Minoan Group/Loyalward have openly declared their intention to return with a new plan, hoping to have it speedily passed through a recently enacted "fast-track" procedure aimed at assisting such projects by bypassing legitimate objections from private citizens and government departments. While the legitimacy of such efforts is questionable, we must remain vigilant. Whether by Minoan Group/Loyalward or some other organization, a new development proposal for Cavo Sidero will be submitted. It is important to be prepared with a plan that works with, not against, the special character of the area. To this end an international conference on the future of this area is planned to be hosted by the provincial government of Lasithi. Thus, the battle to save the Cavo Sidero landscape continues on several different fronts, including a criminal trial set to begin in Khania on April 15, 2011 against the Abbot and seven government expert witnesses. They are accused of fraudulently leading the court into a 1999 decision which secured the Monastery's ownership of the land against claims by the Greek State. As part of the effort to protect Cavo Sidero and other sensitive areas from unsustainable development, an international team (who worked selflessly for over three years with little or no pay) filmed a documentary: A Thousand Lost Golf Balls. A film about development (copyright Real-Life Documentaries 2010, directed by Vangelis Kalaitzis). It presents the full spectrum of opinion about this landmark case; the history of the development; and possible futures for this and other undeveloped areas, exploring proposals for sustainable ways of managing the land for generations to come using its natural assets. It is also a record of the landscape as it is today - undeveloped. The film has now been shown at Ecoweek 2010 and the 2011 Thessaloniki Film Festival; a shorter version is to be aired on Greek TV. If you wish to purchase the film or contribute to its expenses please contact Cliff Cook (writer and narrator) Cliffcoo@otenet.gr. And so with this letter we officially close this Cavo Sidero petition. We are extremely grateful to all 11, 014 of you for signing it and helping preserve this landscape from catastrophic development; it was a magnificent response. Thank you so very much. Reports that the Préveli palm-wood was 'destroyed' by fire in August 2010 are greatly exaggerated (writes Prof Oliver Rackham). The Cretan Palm, like most of the world's palm-trees, is adapted to living with fire. I was not surprised to see photographs from only two months after the fire, showing that most of the trees were recovering. Five months after the fire, I visited Préveli with three American colleagues, and compared the palms with photographs that I took of them in 1981. Almost every single palm-tree had burnt in 2010. But the fire had destroyed only the leaves of the palms, without damaging - indeed stimulating - their well-protected growing points. Every palm-tree had sprouted a new crop of leaves. Only after much searching could we find one single small stem, out of many hundreds, that the fire had killed. Most of the other trees and shrubs, caught in the fire, were sprouting from the base. The Préveli palms have fared well since 1981. We could detect no change in the trees in the gorge after 30 years, except that they have grown taller. There are four outlying groups of palms on the plateau above the gorge. Each of these has increased in number and height. In 1981 there were 9 stems more than 1 metre high; in 2011 there are 25, of which the taller have grown by nearly 2 m.
Both the gorge palms and the outliers had burnt shortly before 1981. Whether there has been a fire in the interval we cannot say. The fire has, however, destroyed most of the dense plantations of pine and cypress that were planted on the plateau 10-15 years ago. This would now be regarded as a mistake. Forests, especially of pine (which attracts fires) and cypress (which needs more moisture) are quite inappropriate for this dry, windswept, barren terrain. To plant the trees, the site was bulldozed and ploughed, which destroyed the natural vegetation and any archaeology and has resulted in erosion. The site should now be left alone and allowed to recover naturally. The palm-wood of Préveli is second in Crete only to that of Vaï. The Cretan Palm is a species peculiar to the south-east Ægean and is a relict from the Tertiary period, at least 10 million years ago. It is a precious survival which Cretans rightly treasure. We now know that even the fiercest fire does not harm Cretan palm. (A third group of palms, at Itanos in east Crete, was burnt some years ago and now flourishes.) I refuse to blame the Fire Brigade for allowing the fire to happen. When a palm-wood burns in a strong wind, no fire-engines or helicopters on earth will put it out: all that should be done is to protect neighbouring people and property, of which there were none at Préveli. Palms, like pines, burn not by misfortune but because they are adapted to promote fire as part of their way of life. For millions of years they have caught fire from time to time (from lightning, if nothing else) and have burnt up their less fire-adapted competitors. We should now ask whether it is wise for the authorities responsible for the palm-wood at Vaï to take elaborate precautions to prevent fire. Vaï has evidently not burnt for many years, despite having been (like Préveli) a hippie camp in the past. Is it good for the palms that they should be deprived of fire? I do not know the answer. The matter becomes urgent with the arrival of a real enemy, the Red Palm Weevil. In recent years there has been a fashion for planting palms. Nearly all of these are not the Cretan Palm but a related species, originally from the Canary Islands, or a Californian palm. Many palms have been shipped from outside Crete, and have inevitably brought this huge insect, which bores into the tree and kills it. Dead Canarian and Californian palms are now unpleasantly familiar in Herákleion and Knossós. It would be a real disaster if the insect were to become established at Préveli or Vaï. I have not seen any signs of weevil damage at either, although there are disturbing reports that the insect has been found at Vaï. The question now needs to be asked, Does fire have any effect on the Red Palm Weevil? In the meantime, people should STOP PLANTING PALMS, especially near the Cretan Palm. Every newly planted palm-tree endangers existing palms near it, whether cultivated or wild. Professor Oliver Rackham is a fellow of Corpus Christi College, Cambridge and a leading expert on woodlands and their history. He is joint author with Jennifer Moody of 'The making of the Cretan landscape'. Photos were taken by Jerolyn Morrison on 12 January 2011. News archive: for old news, click News 2008, News 2009 or News 2010.